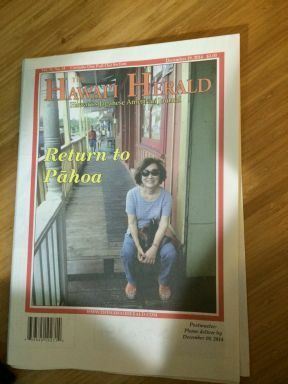 To people of Kapoho and Pahoa, the Hawai’i Herald generously used my story on Madame Pele’s visit to both these towns as their cover story. My open letter to Pahoa, and an excerpt from my Kapoho book may be of interest to you. Thank you. Yes, that’s me on the porch in Pahoa village during my last visit in September. 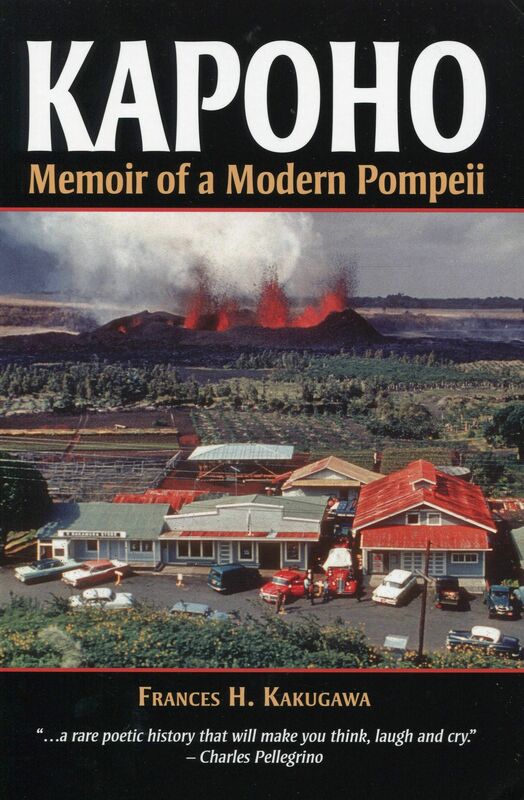 My grandmother’s house was the first to be destroyed by Pele’s lava flow in Kapoho. Today, another family’s house was the first to be covered in Pahoa. So many of us relocated to Pahoa. On my last visit to Hawaii, I visited all our neighbors from Kapoho who now reside in Pahoa. How are we? What can we be except philosophers when it comes to the power of Fire Goddess Pele whom we respect and fear. My heart goes out to everyone. The sun is shining out here but I feel the dark clouds and smell sulphur in the air from memory. Kapoho’s history of being covered by lava flows is now Pahoa’s. And once again, our respect for fire goddess Pele is heard over and over again as seen in the excerpts below. I hope all the communities will be there for the residents of Pahoa just as they were for us, when we evacuated from Kapoho and relocated in Pahoa. Our hearts are broken once again. I was away in college, buried under my studies to get pidgin out of my mouth on my way to becoming a famous writer. I had no way of learning firsthand what was happening to my family and friends in or out of Kapoho. That panic later turned into anger as I shot bombastic arrows into my speech class. Instead of giving my prepared speech that day, I tossed it aside and gave vent to some improvised rage. “Kapoho, my hometown, is being destroyed by lava as I stand here. In the snack bar downstairs, in the media and in conversations among many of you who have taken helicopter rides to view the eruption, I hear you saying things like ‘spectacular,’ ‘awesome’ and even ‘inspiring.’ The camera lenses and the firsthand sightings from low-flying helicopter rides only show Pele’s fire. That can be awesome. Spectacular, even, if Kapoho were just a piece of dirt, a nowhere place that nobody cares about. But Kapoho is where I grew up. “My family has evacuated to my aunt’s house. I was there last weekend when my father’s name shrieked from the radio to identify the next house that was destroyed. My father’s response made me feel afraid for him as I watched his disbelief. I was afraid that his mind could crack like the land beneath our house, cracked wide open by earthquakes. “My father looked at us and said, ‘That can’t be me. That must be another Sadame Kakugawa.’ It was spooky to hear him say that. “My father is a simple plantation worker. He earns minimum wage to support our family of seven and send me to school. We depend on our thirteen acres of cane land to pay off our debts. Losing our home would just kill him. I sat abruptly down. At least one person had heard me that day, because for the rest of the year, my lunches were paid for at the snack bar. All I knew about my benefactor was that he was a veteran.